Today, we’re extremely excited to announce that Paribus is completely FREE! That means that every dollar we save you now stays in your wallet. There is none. We’re offering the same great service, only now you get to keep 100% of your savings when you get a refund — no hidden fees, nothing your mother would frown at. For more information, check out the updated Terms of Service, including some updates to our refund process. We believe it is important to find ways to help people save time and money, without any catches. In fact, we’ve identified over $6.5 million in potential savings for our users to date. Whether it’s finding you money when the price of something you bought at one of over 20 retailers we monitorgoes down, or helping you get money back from Amazon or Walmart when an item you ordered with expedited shipping arrives late, we’re here to help! Want to learn more? Click here. ShopKick adds rewards for online shopping! I’m excited to share that today we’ve updated Shopkick with some exciting new features. For the first time ever, you can earn kicks for shopping online! Shopkickers have told us how much fun they have using Shopkick, and they want more opportunities to earn free gift cards and other merchandise. With these new updates, you can enjoy three new ways to get kicks for online shopping. You can now earn kicks for visiting online stores, viewing online offers, and making purchases from Apple, Boxed, eBay, Groupon, Spring, and Jet.com. We’ll do everything we can to make your online or offline shopping trip — whether it’s for groceries, apparel, or electronics — as fun and rewarding as possible. I invite you to try out these new features and connect with us on Facebook to share what you think. Gift Card Granny is where I go to buy discount eBay and iTunes gift cards. I use the iTunes gift cards for the iOS apps that BestReviewApps lists where the app costs money. I make that money back, plus the reward money for downloading and reviewing those apps. Average savings on iTunes gift cards has been $0.09 for every $1.00 spent. So I buy an app that costs $0.99, it only costs me out of pocket $0.90. I also will get $1.00-$1.50 back on top of the full $0.99 that the app costs when I do the BestReviewApps review. So I spent $0.90 and I potentially get back $1.99-2.49! I also get AMC theater gift cards, so movie going is a lot cheaper (I usually find 12-20% discounts on their gift cards), plus signing up for the AMC stubs program (free for Insiders, $15/year for Premier, which I also pay for using the gift cards I purchased on GiftCardGranny! ), which gives me points for purchasing tickets, food, etc. on top of waiving the online ticket purchase fees through their website or Fandango. So I am basically earning more AMC Stubs points per actual dollar spent. I have notification alerts should any Hulu gift cards show up. I always look for gift cards here first before I go shopping to make sure if I can save the most money. They can deliver e-gift cards or actual physical gift cards. When you select the card(s) you want, you will be redirected to seller sites, not actually purchasing the card(s) in GiftCardGranny. 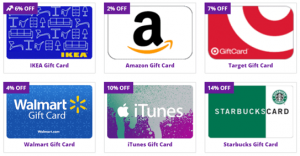 Some sites through GiftCardGranny have stars next to their name because they award points on GiftCardGranny which can be used for added benefits, or towards future gift card purchases. Click Here to Sign Up and Start Saving on Gift Cards! Yes, once in a while, I will sprinkle in a post or two about products or programs that I like to spend money on or suggest you spend your money on. We deserve good things, to “Treat Yo Self” for being so lazy when it comes to making money. MavenX is a site I have been using similar to Pinterest to post about products I like, products I have bought, and wishlist items as well. They currently are highlighting a Mother’s Day special deal for the site Things Remembered and I made a board of some of the stuff I want and stuff I want to get for my wife HERE. Their special deal is 20% off plus free shipping with promo code A159 (valid though Mother’s Day, May 14)!